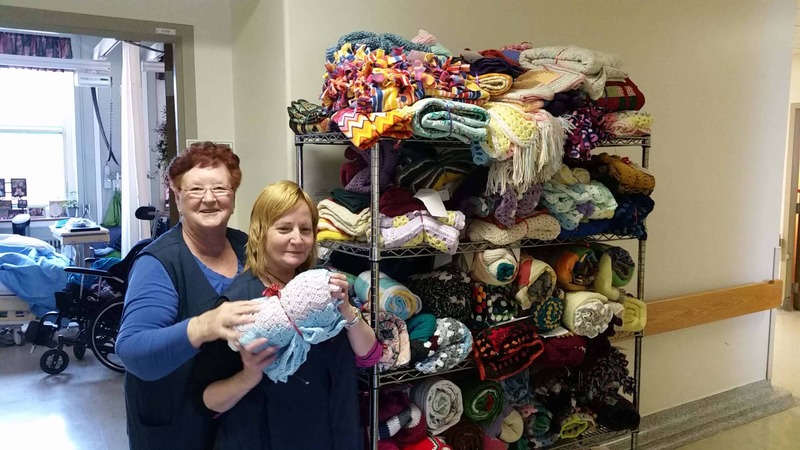 Various church groups in the Kingston Community have been hard at work for months now, knitting lap blankets and making beautiful quilts for our patients at St. Mary’s of the Lake Hospital. This is all part of an annual tradition to ensure that each one of our patients at St. Mary’s of the Lake Hospital receives a Christmas gift. This has been ongoing for some time now and Volunteer Services is the department who organizes and coordinates it all. Numerous church groups in the Kingston area are kind enough to donate their time and also their money to purchase supplies to make the blankets and quilts. Their generosity is outstanding and handing out the gifts to patients each year often comes with emotional responses. When they were doing their deliveries, one patient said “I have no family here. What a wonderful thing the volunteers are doing for us.” Another patient visibly teared up as her family is also out of town and the special delivery was a highlight of her week.